Burnside Brewing Co. releases a long in the making collaboration "Project Ale" as a tribute to the Burnside Skatepark which began as a 3-ft x 3-ft bank under the Burnside Bridge and became one of the premier skate parks in the world. It was built by local skaters is on the east side of Portland and was featured in the original Tony Hawk Pro Skater video game. 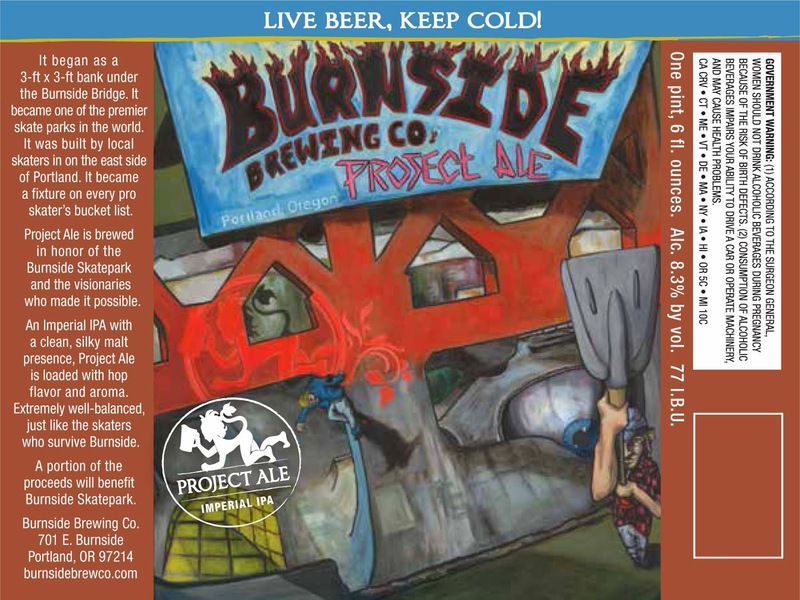 Project Ale is brewed in honor of the Burnside Skatepark and is an Imperial IPA with a clean, silky malt presence, and is loaded with hop flavor and aroma. A portion of the proceeds will benefit Burnside Skatepark. Project Ale is a new year-round bottled Imperial IPA from Burnside Brewing, first only available in Oregon at specialty retailer accounts. Coming in a 99.5 IBUs and 8% alcohol this beer is not to be trifled with. The Project Ale recipe is based upon popular (but never before bottled) Burnside pub beer "Alter Ego." The Project Ale version of Alter Ego has three additional hoppings including a dry-hop with Bullions for maximum flavor and aroma impact. So is this out yet or is itself coming soon? If this is out where have you found it as I haven't seen it around. Just released today. Should be in stores soon.